I’m just going to level with y’all right now. I didn’t truly participate in Raw Wednesday this week. I know, I know. I’m properly ashamed and all. It’s just that I was in minor panic mode all day long (more on that later) and didn’t really eat much, and when I did, I couldn’t be bothered to do anything more than reheat a leftover vegan enchilada my wonderful daddy made for dinner a couple of nights ago. That was lunch; I skipped breakfast (I know!) and had a vegan burger for dinner… the kind from a box. I know. I did, however, go raw for dessert. By which I mean I ate an apple. So… that counts, right? Counts-ish? Maybe? Okay, maybe not. But honestly, I couldn’t be arsed to make a more complex dessert, and Honeycrisp apples were on sale at the grocery store today, and they just looked so inviting in the fruit bowl… and you know what? I don’t think I’ve ever had a Honeycrisp before tonight. But they’re listed on that Vegan’s 100 List which seems to make for an excellent lazy-day MoFo post (mine’s coming, don’t you worry), and people have been blogging left and right about their deliciousness… so I had to try one. Ooer. I think they live up to all the hype. Honeycrisps are kind of my perfect apple, sweet but not too sweet, a little bit juicy, and, well, crisp. It was love at first bite. I didn’t even know it was Raw Wednesday!!! I have got to get in the loop. That apple looks sooo good. 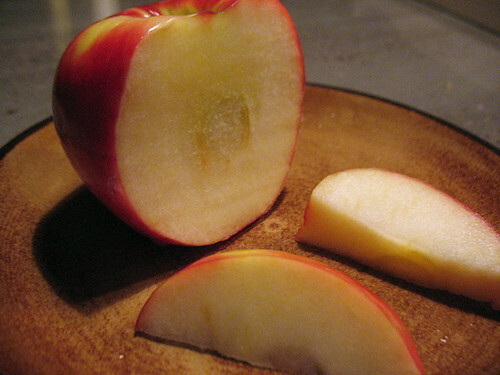 I also love the Honeycrisp… and I think simple, delicious fruit is an excellent dessert! I LOVE honey crisps! So juicy and delicious.